The All Assam Minority Students’ Union on Tuesday has threatened to launch agitation if the government fails to protect the erosion hit people of Morigaon district. An AAMSU delegation visited the erosion affected area on Tuesday and took stock of the situation there. AAMSU president Rejaul Karim Laskar has demanded permanent solution to the erosion problem of the area and compensation to erosion hit people. He accused the Water Resources minister of indulging in corruption in the name of checking erosion. The AAMSU leader also threatened to launch agitation if the government fails to take steps to protect the people from erosion. 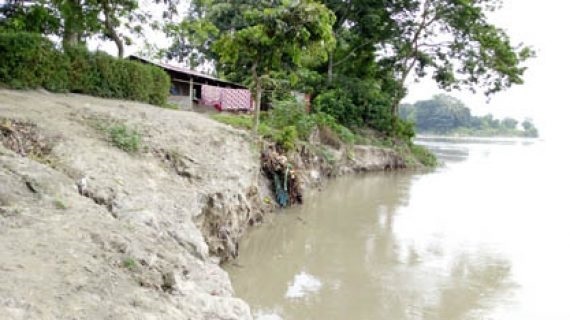 Erosion has assumed an alarming proportion at Tulsibari in Lahorighat under Morigaon district. Unabated erosion by the mighty Brahmaputra has forced the villagers to take shelter on streets. The surging Brahmaputra has eroded school, madrasa, mosque in the area. Hundreds of people were rendered homeless due to continuous erosion. They were forced to live on the street and facing the crisis of food and shelter. Though the government has made arrangement to check erosion by fortifying the area with geobags, people living in the riverine area are not impressed with this kind of arrangement.